You cannot be an expert in childcare and education in a whimper – to start with!! It’s not a child’s play! Also, not everyone can excel in childcare and providing kids with a proper education. You need to have a unique acumen and quality in you if you are to excel as a childcare expert. And of course, you need to have proper training. So what makes you an expert in this field? The answer is pretty simple! You need to have a zeal to be an expert in this field, and the urge to work with kids. Most importantly, you need to undertake those courses that give you degrees and diplomas in childcare and education. Now there are two types of courses – online and classroom-based. People quite often are in a dilemma of whether picking up an online course will suffice the requirements, or a conventional classroom-based course will be more feasible. Well, the online courses will surely help you out in multiple ways, provided you take up a course from reputed organisations like Gold Coast Institute of Technology. We come up with a state of the art online learning curriculum, which enables the trainees to experience all the support that is being provided to those who have opted for classroom courses. Besides, they will get the flexibility that the classroom courses do not have. 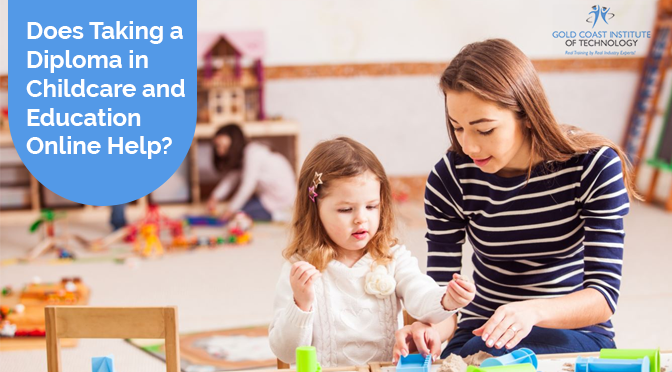 Our online childcare and education curriculum will help you study at a place and time which will suit you the best. This means when you have convenience at your side, you have more probability of success. If there is any place on the earth where you feel most at ease and comfortable, it is your home. It’s the homely ambience that gives you that easing feeling – something that goes miles to help you complete the course materials more authoritatively. This is pretty natural, as you do not have to commute for attending classes of diploma in childcare and education. All you need to do is to get in touch with us and register for the online curriculum that we offer. Your home practically becomes your campus in a jiffy! When you train online, you do not stretch and thus, do not get stressed up. You can continue with your daily life and still can persuade the course. Just a few hours of study at any time of the day or night will be more than enough. Wary of missing classmates to consult? Never mind! We have forums that are attended by aspirants who have taken up online courses like you. So that is something that should lighten your eyes up! You can very well join the online study groups and have discussions with other aspirants and nurture your knowledge and share your views that help in cohesive learning! It makes you a better advocate of childcare and education at the end of the day. You see, that’s the beauty of the online diploma course of childcare that we come up with. They are cheap as well and hence will go a long way in saving the depth of your wallet. Besides, our experts will provide you with the support and guidance at your hour of need whenever you ask for it. Therefore, with immense support from every quarter, the online curriculum we come up with at Gold Coast Institute of Technology is one of the most effective ones, when it comes to the making of childcare and education specialists. Just call us at the number you will find on our website, or write us an email and we will get right back to you with all the answers to your queries! Previous PostHow Much Important are ‘HEALTH’ & ‘SAFETY’ in Childcare Facility?